In the future, he arrives on Earth and goes on a rampage, leaving humanity on the brink of extinction. He encounters Trunks and easily defeats him. Trunks survives their encounter and, for one year and half, prepares to travel back in time using a Time Machine with Bulma in an attempt to save the future. Trunks and Bulma are eventually intercepted by Gokuu Black himself when the villain kills Bulma and destroys their hideout. Trunks narrowly escapes with enough fuel for a one-way trip back to the past while Gokuu Black pursues him. Gokuu Black appears again and attacks Mai and taunts Trunks. He is the Zamasu in the original flow of time wich succeeded in carrying out his plans to kill Gowasu and take his Potara Earrings and Time Ring. Following this, he used these items to gather and use the Super Dragon Balls to switch his body with Goku, becoming Goku Black, and traveled to Future Trunks' timeline and allied with his counterpart there. 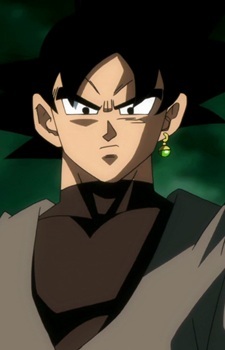 As Goku Black, the Time Ring he wore stopped him from being erased from existence once his past self was "killed", after time had been altered.